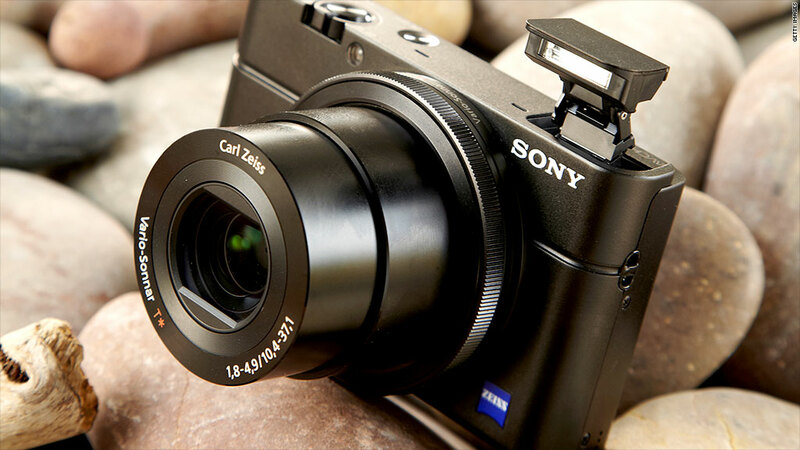 The Sony RX100's combination of powerful performance and small size is hard to resist. If you're not quite looking for the power of a professional camera but you appreciate the benefits of taking quality photos, Sony's RX100 is the perfect choice -- and CNNMoney's Best in Tech for the point-and-shoot camera category. When Sony (SNE) released it last year, the RX100 was one of the first serious cameras to strike a smart balance between the price and size of point-and-shoot cameras, and the image quality and performance of DSLRs. At its best -- which is to say any well-lit environment -- the RX100's photos can be indistinguishable from a DSLR, requiring an expert eye to see how a more expensive camera is superior. And the RX100 delivers great results with minimal effort. When set to "auto" the lens is almost always quick to focus. Shots are sharp, vibrant, and overall pleasing to the eye. For those desiring a little more control over their shots, the programmable ring around the lens, along with full manual control, will let you experiment to your heart's content. The RX100 lets you record video too. It's more of a secondary feature, but in the right hands and using right setting, movies shot using the RX100 can impress too. The camera's design is also a winner. Constructed almost entirely of aluminum, the black case has a simple, classic design that pays homage to old-school cameras while still looking like a 21st century device. It is solidly constructed, but not clunky, and every button, knob and dial exudes quality. But the $600 camera comes with plenty of compromises. You're stuck with the 28-100mm fixed lens. In lower light, image quality starts to drop off faster than it should, especially when you use the zoom function. It's not quite as pocketable as most of its point-and-shoot counterparts, nor does the battery last quite as long. And the price tag will certainly scare a few people away (though you can easily find it for $500). There's also the $750 RX100 MKII to consider, which features the same lens, a hotshoe for adding accessories and also has a big one-inch sensor. It also adds a few light absorbing tricks to that sensor to markedly improve its low-light performance. If you're not quite a hobbyist, but you're in the market for a camera that is noticeably better than your phone, the RX100 is the camera to spring for.